Austria does not often make political headlines. It has at least twice in recent years: in 1986, when the ""Waldheim Affair"" was debated worldwide, and in 1999, when the Austrian Freedom Party (FPOe) under Joerg Haider received 27 percent of the vote in national elections. Established by former Nazis for former Nazis, the FPOe entered the mainstream of Austrian politics when it became part of a coalition government. 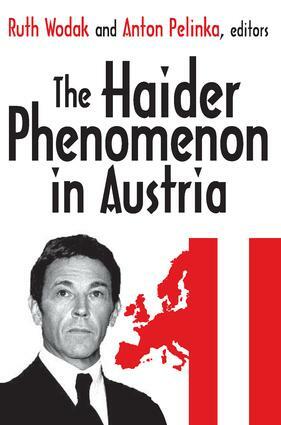 This volume explores whether its rise is a uniquely Austrian phenomenon or corresponds to broader social and political changes in Europe.Parallels to Haider's party can be found in other European countries. Its anti-immigration agenda and rhetoric are similar to those of the French FN, the Belgian Vlaams Bloc, and the Italian Lega Nord. And its anti-European Union posture is similar to the sentiments of the ""anti-Maastrich"" wing of the British conservative party. However, European reaction to the FPOe's rise derives not only from its policies, but its linkage to past suspicions that the Austrians have not learned the lessons of history as had the Germans. The FPOe's success strengthened that impression. In response, 14 European Union governments downgraded their bilateral relations with the Austrian government to a purely technical level. Although the sanctions were lifted in September 2000, the spotlight is still very much on Austria, and concern about the FPOe remains high.This important volume contains eleven chapters by internationally prominent scholars from a broad spectrum of the social sciences. Its cross-disciplinary approach provides perspective on the Haider phenomenon, its rhetoric, and its impact on daily life in Austria. It also analyzes the influence of right-wing populism on politics, culture, and society, and its implications in Austria as well as elsewhere in Europe. The Haider Phenomenon will be of interest to historians, political scientists, those in European studies, and scholars in contemporary political extremism. Who the Hell is Jörg Haider?